Even though I am not dairy-free, I have been making almond milk for many years, and never tire of it! When I drink it, it feels clean in my body, similar to the feeling I get when drinking juice of dark leafy greens. It also serves as a base for milkshakes. This recipe calls for soaked almonds. All nuts and seeds should be soaked in filtered water with salt for at least 8 hours for optimal digestion and assimilation of nutrients. All nuts and seeds (and grains and beans) come with enzyme inhibitors. The salt activates enzymes that neutralize the enzyme inhibitors. So if nuts have given you poor digestion or gas in the past, try soaking them this way! After pureeing the almonds with the water, it is ideal to use a nutbag to s eparate the almond meal (pureed almonds) from the newly made almond milk. A nutbag is a finely meshed cloth bag. Alternatively, you could use a towel or cheesecloth, which you can buy at the natural food store. Or you can keep the almond meal in the newly pureed almond milk—it just settles to the bottom of the blender. It is ideal to separate out the almond meal for those who have a hard time digesting nuts because the skins are believed to be hard to digest and best removed before consumption. However, depending on the almonds, after soaking, you may be able to easily pop off the skins with your fingers. You can also make nut milk with any other nut or seed, including sunflower, sesame and pumpkin seeds, cashews, pecans and walnuts. You can use this recipe as a base for eggnog and chai. Blend soaked almonds and water. 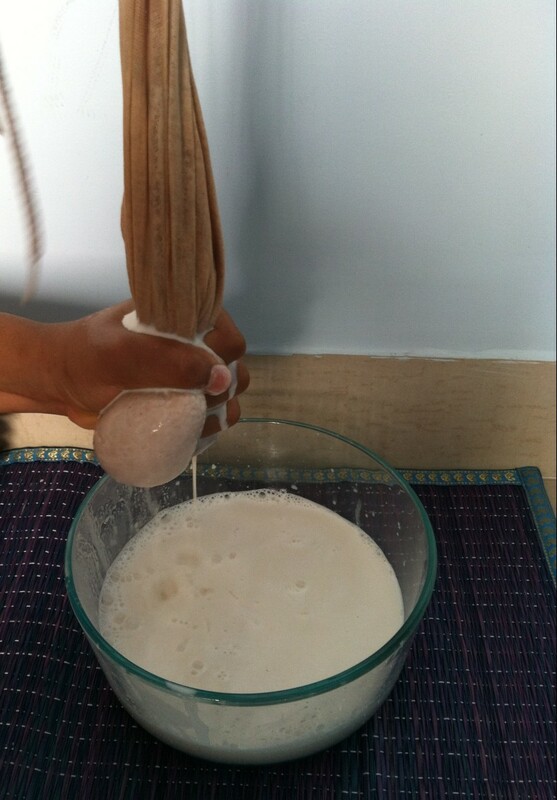 Pour mixture through nutbag or cloth to separate the milk from the almonds. Pour the milk back into the blender, add vanilla and blend. Reserve the almond meal in the freezer. This can be a flour substitute for grain-free recipes calling for almond flour (after dehydrating it). Stores for two to three days in the fridge. My favorite is Cacao Almond Milkshake. Cacao is raw chocolate. You can find it at the natural food store. Blend milk with bananas and vanilla or cacao powder. 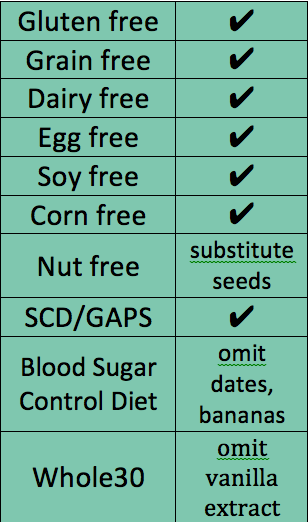 For those following the GAPS diet: See this post for more information about eating chocolate/cacao on the GAPS diet. Dr. Natasha Campbell-McBride, the creator of the GAPS program, has stated that tropical fruits should not be combined with non-tropical fruits or other foods. Thus, this almond milk does not exactly comply with the GAPS diet. If you are on GAPS and you have decent digestion, you may be able to get away with combining nuts with fruit (I did). GAPS aside, chocolate is known to be a gut irritant for those with sensitive guts.